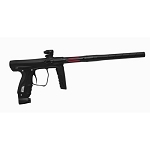 The latest bolt system from SP the Shocker® XLS bolt system elevates the Shocker®’s performance to a whole new level. By taking advantage of the longer marker platform, the Shocker® XLS bolt system has a larger internal volume resulting in even lower operating pressure of 145psi. The lower operating pressure allows the Shocker® XLS to provide a smoother, quieter shot than previous generations of Shocker® while maintaining the same level of effciency. When paired with refinements to the regulator design – the XLS bolt system has a faster recharge and greater consistency at full rate of fire then ever before. The Freak® XL features a longer control bore that allows the air to remain behind the ball longer, allowing it to do more work accelerating the ball – with less air. This means that the new Shocker® XLS can operate at lower operating pressure, and increase efficiency over previous Shocker® models. Because the new Shocker® XLS uses the Freak XL barrel system, players now have the added advantage of quick turn autococker threads on the factory Freak XL barrel back – so removing your barrel takes 1/2 as many turns while remaining compatible with any autococker threaded marker. Water resistant coating is applied to all of the electronic boards in the Shocker® and helps keep the marker laying paint, even in the rain. The new XLS screen cover increases water and debris resistance with a weather tough power button. The Shocker® XLS weather tough screen cover raises the over all water and debris resistance of the Shocker® electronics package. Because the new button also has greater travel, the switch is also easier to operate with larger fingers or even gloves. Intuitive trigger based programming makes it easy to make changes to firing mode, rate of fire and even dwell with just a button click and a few trigger inputs. If you make a mistake, or forget the stock setting – a factory reset takes just 5 seconds. Standard mini-usb connection makes software updates a snap with any USB data cable and a Windows PC. SP works along side leagues all over the world to make sure that the Shocker® always has the capability to adhere to any mode of fire, or rate of fire limits put in place my major leagues. The USB software update system also allows players to change the language displayed on the screen with just a quick update. Angled lever style ball detents are extremely soft on paint, while maintaining enough tension for even the most forceful loaders. The ball detents are also incredibly durable, lasting millions of cycles with simple cleaning. Thoughtful design of the bolt tip prevents clipping when used with high force loaders. The bolts rounded edge, and forward o-ring guide the paintball stack carefully out of the way when chambering and firing the paintball in the breach. The open face bolt design physically contacts the ball at its strongest point – its edge – thus distributing any physical force across the greatest surface area of the ball. Designed to maximize the effectiveness of the Shocker® lever style ball detents – the bolt face works with the detents to minimize roll back (paint moving in the breach due to small or oddly shaped paintballs). Drawing extensively on player feedback the Shocker® XLS trigger system offers increased simplicity and ease of maintenance/adjustment alongside its outstanding performance. Adjustment screws are up-sized from previous generations, now using a 1/16th hex key – offering better tool engagement, easier application of torque and longer hardware life. The XLS features a re-designed mount system that takes the guess work out of centering the trigger – a wiggle free perfectly centered trigger is accomplished a single mount screw. Trigger removal is accomplished with the same 1/16th hex key used for trigger adjustment. n development of the Shocker® XLS platform SP challenged its engineers to squeeze even more performance from the Shocker® regulator design. The result is the new XLS regulator piston – machined from aircraft grade aluminum and Type III hard anodized. The XLS regulator piston uses the same seals that have been proven consistent and durable – but with lighter weight and higher flow. The XLS piston allows a faster recharge rate, and greater consistency while at maximum rate of fire than previous generation Shockers®. The XLS regulator piston also has a retention ring – which allows the secondary spring to remain attached to the piston, offering easier disassembly for regulator service. The Shocker® XLS features upgraded thumbwheel feedtube adjustment making fitting any loader on the market easier than ever. With the creation of the Shocker® XLS we wanted to elevate all aspects of the experience of owning a Shocker® and that includes the case. The new Shocker® XLS case has been trimmed down, and beefed up to be more compact and rugged than ever before. In addition to cutting down the overall thickness – we have utilized a new carbon pattern material to add water and dirt resistance to the outer skin of the case.